Suddenly we can't move for gigs. The threatened Occupy Event is go, friday October 5th at the Gregson in Lancaster, details here. We've been asked to play three songs, so are currently in intense in-band negotiations as to which three of our songs stick it to the man the *most*. We're due on 9ish (apparently), but the evening confidently promises "entertainment, Process and Mischief. Music, poetry, stories, magic, theatre, film". No, I'm not sure what "Process" means in that context, either. 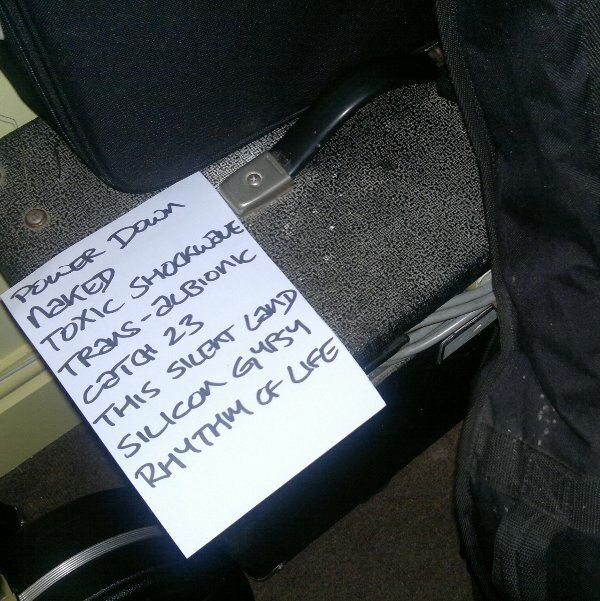 The Dock Of The Bay mini-festival at Glasson was fun (pictured is our set list), although it really did underline for us how long it's been since we played through a proper PA. I'm not sure we much suit being mixed as a full-on rock band any longer (though maybe it's just us being rusty), & think we might have done better on the al fresco Melodrome stage - & not just because it was such a sunny day that most of the attendees were sat out there. Regardless, the mood was lovely, the chilli was hot & the beer was cold, what more can you ask for? Highlight of the day would be Dan Rathbone's three-year-old daughter Freya running around with her hands over her ears, then coming up to the stage to say "well done, Daddy!" after every number. We've been away too long.